Herb Parsons bridge recovery and improvement. 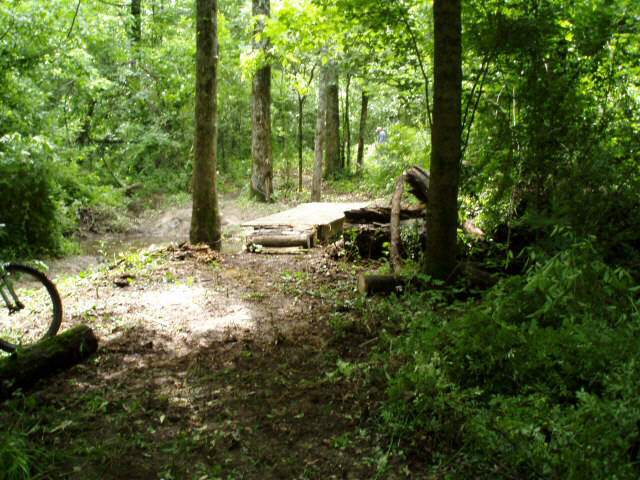 MSTA recovered the bridge at the last creek on the south side of the lake. The bridge was set a bad location and was too short to span the creek. 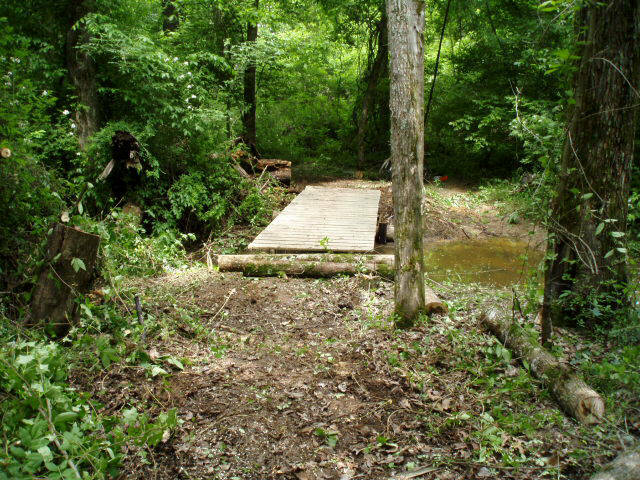 The bridge was floating upside down in the creek downstream of the trail crossing. The bridge project was done in three phases. 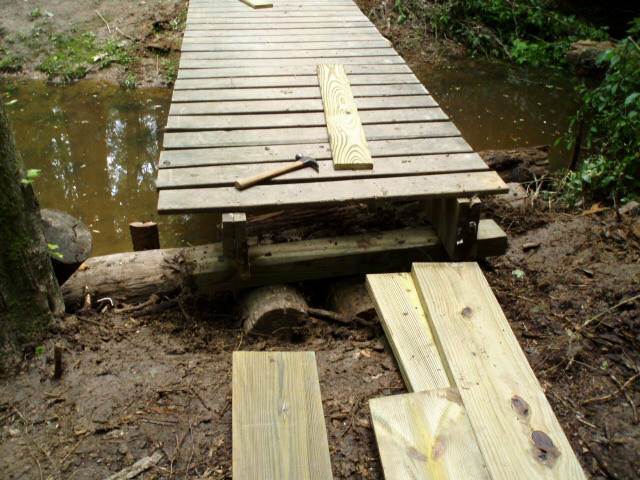 First was to bring the bridge up the creek back to the trail location. 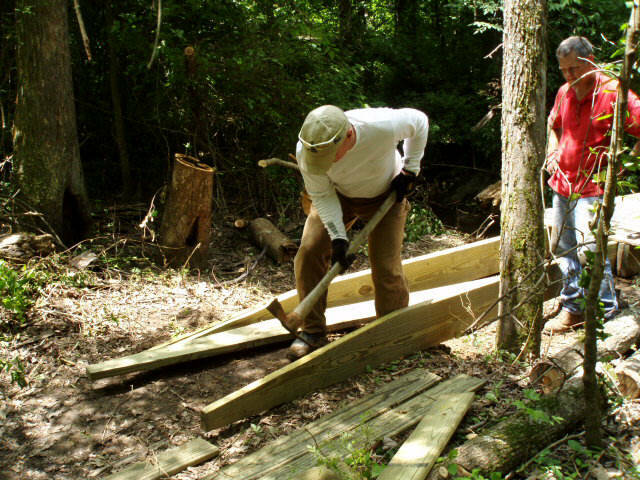 The second phase was clearing new approach trails and building temporary footings. 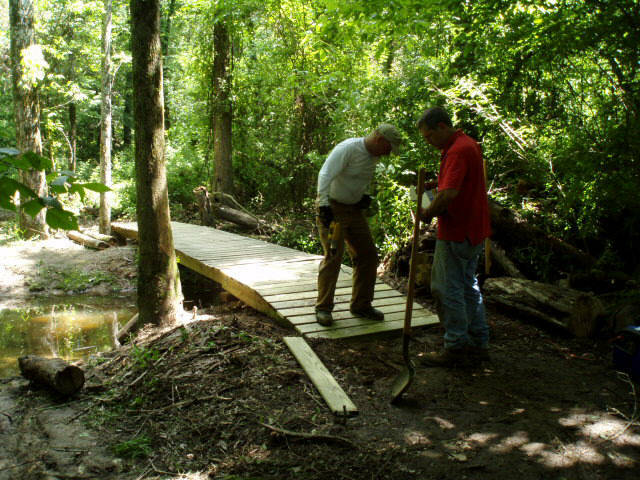 The third phase was setting the bridge on new footings above the creek level and building extensions at each end to link the bridge with the trail. The bridge after phase 2 east end temporary transition. Bridge west end with temporary transition. 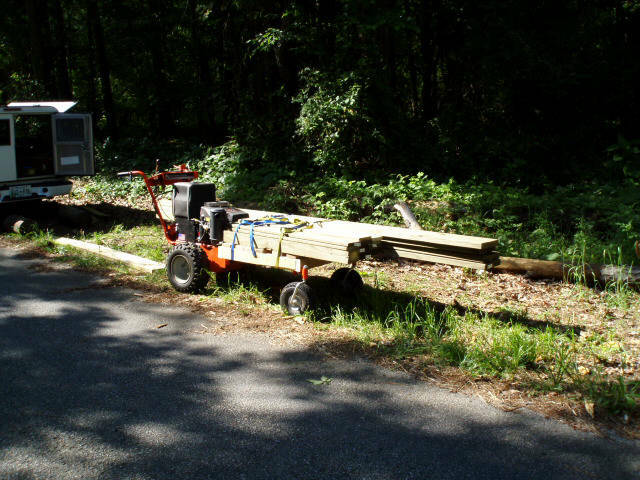 Steve K. modified his DR mower to build a materials hauler. Here it is with the first load of bridge materials. 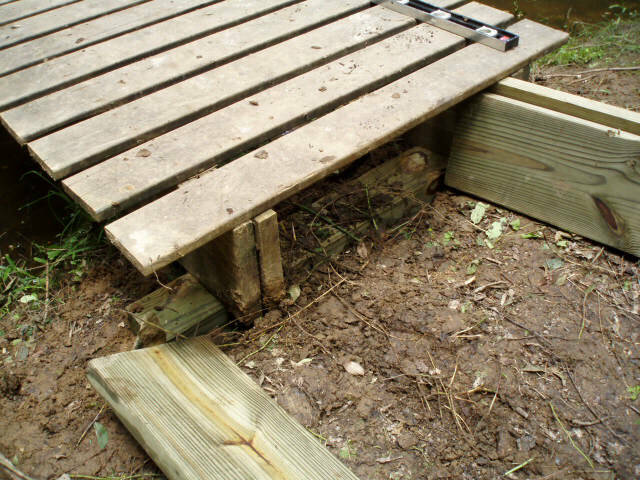 The east end of the bridge needed a secure footing. This is the new footing to support the bridge above the creek. The west bank also got an improved footing. Excavating for the transition section on the west side. The west end is ready for decking. The east end is completed. The first rider. 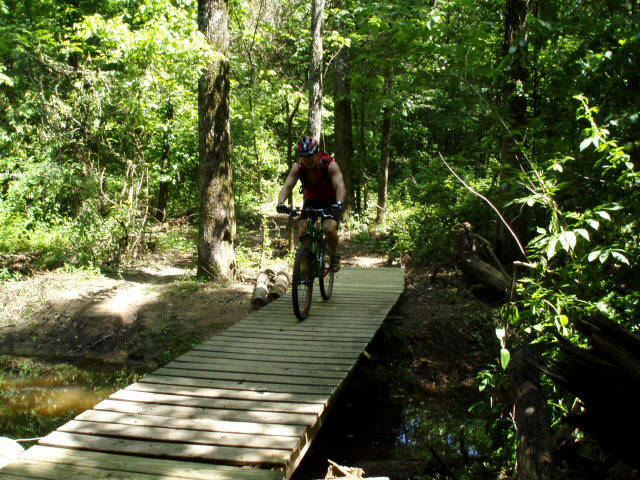 Jay was riding the trail and was our first rider across the completed bridge. The original 16 foot span is now expanded to 35 feet. There is a little offset on the west side to better line up with the approach trail. 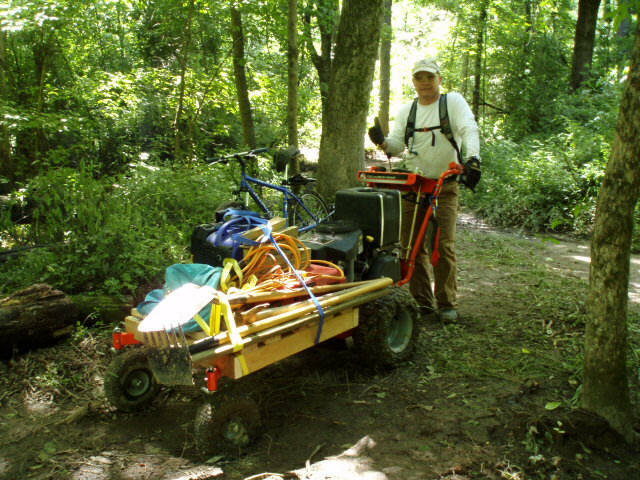 Here is the hauler with the tools loaded up for the return to the vehicles and some well deserved frosty beverages. Mmm, good.